"I am a completely different person. I am more composed, calm and I am a lot happier. "That's all down to walking football." After an active childhood, Bob Barritt saw his physical and mental health deteriorate in adulthood. "I used to play football in school and my teenage years but when I got older, I didn't do anything at all," Bob, pictured above left, says. In 2006 he had a heart attack and a bad reaction to the subsequent medicine made recovery difficult. "My legs swelled up; I couldn't walk," the West Ham United fan says. "I was housebound for nearly 18 months." Bob put on weight, reaching almost 35 stone (220kg). This started to have a serious impact on his mental health, too. "I saw no way out of the hole I was in," he says. "Everything got on top of me and I was in a very bad way. "I was at the lowest point I could be." Bob remained determined to get fit and after seeing walking football on television, gave it a go. "I didn't know what to expect in that first session," he says. "I just went down there to see what it was like. "I was nervous but the boys made me feel so welcome. It was a lot of fun." 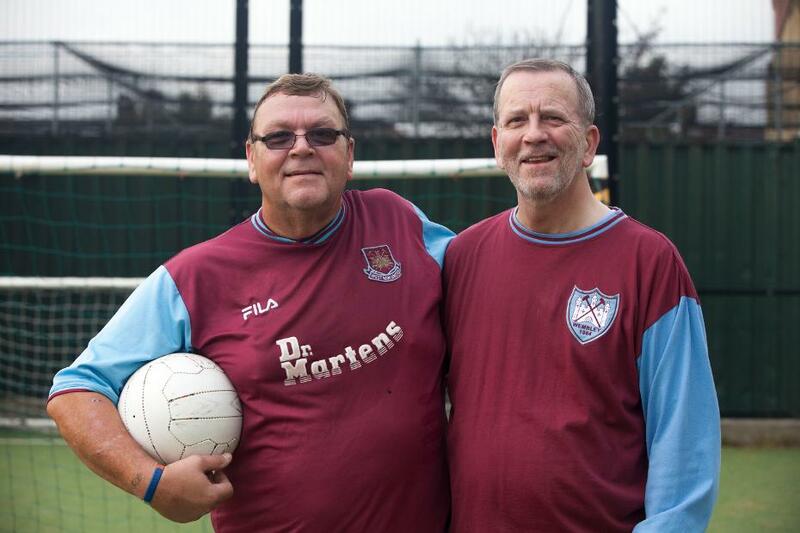 In 2016, Bob's team started playing for the West Ham United Foundation as part of its Walking Football programme. He scored the club's first goal with West Ham and has gone on to play 200 matches for the team. "It benefited me like you wouldn't believe," he says. "I have met a lot of guys who are my best friends now. They are family. "I used to get stressed out, but every time I played for them, they gave me a lift. "Having two games a week was brilliant. It made me lose a lot of weight." Bob moved to Lincolnshire but still travels down to play in tournaments for West Ham, while also joining a new team near his Mablethorpe home. "I won't stop playing," the 55-year-old says. "Walking football is such a simple thing. "There is so much physically and mentally people can gain from it." To mark its expansion of the programme, the Foundation got Danny Dyer to referee a special walking football match at the club's Chadwell Heath training complex, which the actor did in his own inimitable style. The Foundation's Active United has sessions that include basketball as well as football. It is also looking to help the homeless stay active by working with the local Caritas Anchor House shelter. With more than 1,500 attendances at the Foundation's sessions so far, there are many other transformations similar to Bob's. "I am a completely different person," he says. "I am more composed, calm and I am a lot happier. That's all down to walking football."